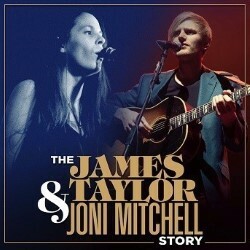 Following two consecutive years of sell-outs and critical acclaim, the James Taylor and Joni Mitchell stories combine into one exciting show to take you on a journey through the interwoven lives of these two legends. Presented in our Night Owl Shows signature show-umentary format this presentation offers a fascinating insight into the music. Featuring hits such as Both Sides Now, Big Yellow Taxi, Case Of You, You’ve Got a Friend, Fire and Rain and Sweet Baby James. 'Crystal clarity' **** (BroadwayBaby.com). 'Immaculate' **** (ThreeWeeks).